We have already passed the first half of February of this year, so this article is overdue, if we want to make this kind of posting a tradition. 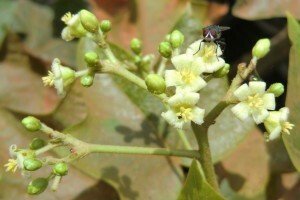 See last years version here: The Bionic Jatropha Breeding Program in 2012. In December we have reached the BC2 stage following our interspecific breeding path. The first batch of BC2s are all descendants of an early and white flowering BC1, the female parent of which is in turn our non-toxic, male-sterile Jatropha plant from the wild in Guatemala. The pollen donor was an interspecific hybrid crossed from an elite toxic JcL cultivar and Jatropha integerrima. Many more genetically diverse BC2 hybrids will follow over the course of this year as our large population of different BC1s gradually start flowering. Some actually have done so by now. Quite unexpectedly earlier in 2012 we observed enormous heterosis effects (hybrid vigor) in several different intraspecific hybrids we had kind of neglected. Some increasing seed weight compared to their parents by up to 100%. A finding which made us gravely rethink and adjust our breeding processes and objectives. Later we then saw heterosis again in another hybrid with fruit clusters consistently around 50 fruits and seed weight still significantly above the parental average. All three of those hybrids initiated flowering only 6 months after seed germination. These plants actually convinced us that consistent seed yields of 10 kg and more are within reach. We do expect to see a lot more of positive heterosis results as we only started to fully exploit our germplasm collection by crossing our genetically most distant accessions in the late months of 2012. Two more areas are worth mentioning where we expanded our knowledge of Jatropha development significantly during 2012, possibly taking us to a global leadership position in Jatropha R&D: Grafting and multi species (more than 2) Jatropha hybridization. We have made great progress on both work streams and do expect major break-throughs to be reported by the end of this year. The walk through of our 2012 results actually already covers most of the outlook for 2013: our interspecific hybrids will most likely reach BC4 stage moving closer to possible commercial exploitation through selection from a widening population and dedicated heterosis breeding will teach us all we need to know to develop a first line of F1 hybrids in 2014 from our germplasm range. The first 6 weeks of 2013 gave us an extra boost in confidence looking at the great developments we saw in the usually not very eventful core dry season here in Ghana. This is symbolized by the beautiful flowers on the left, another BC1 which set flowers for the first time in January which were manually pollinated and emerged into 4 fast growing fruits by now. 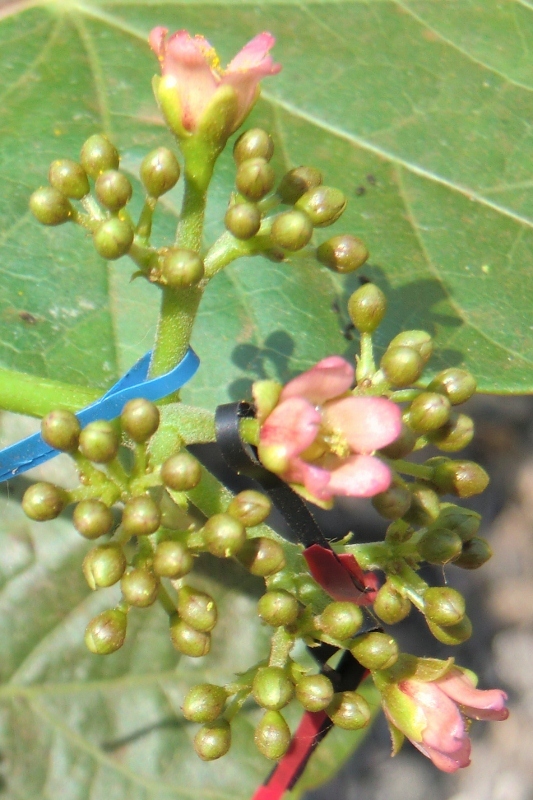 This entry was posted in Breeding, Breeding program and tagged company history, Jatropha breeding, jatropha development on February 15, 2013 by Ulrich Riemann.